Una Mamma Italiana: NEW: The Meatball Challenge Champion! When Dominic Condo and Una Mamma Italiana, two of my fellow Cucina Chatter radio contributors asked me to weigh in on their meatball competition, I didn’t hesitate for a second! I love anything having to do with meatballs, especially trying new twists on how to make them or how to serve them. Unfortunately, I only got to “virtually” try them, by reading the mouth-watering recipes they both shared on their respective food sites and by looking at the tantalizing pictures. Neither were reinventing the actual meatball, rather coming up with different ways to serve them. Nice job you guys, Lorraine can attest to the fact that there’s never any losers in an Italian cucina—even though my meatballs and gravy won out when we squared off in our own throwdowns last year. Keep on rollin’! 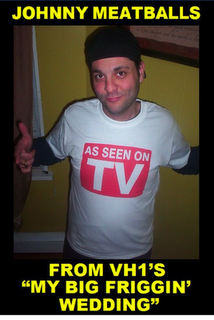 Meatball King of New Jersey - As Seen on TV! A big Italian congratulations to Dom on his FIRST win of our "Mamma Meets The Cucina" food challenges! Of course, there's no need to mention that I won the last two competitions in a row. But naturally, I'll say it! And it was time to let him taste victory - just this once.